Notice: The Arizona Independent Redistricting Commission appointed in 2011 developed this comprehensive website to inform the public about its work. That Commission adopted new congressional and legislative districts for Arizona in January 2012 and prevailed in all litigation challenging its work. After all redistricting litigation for the decade ended, the Commission ceased its operations as required by the Arizona Constitution. A new Commission will be appointed in 2021 to adopt new congressional and legislative districts for Arizona following the next census. Although the 2011 Commission’s work is done, this website is being maintained for historical purposes. 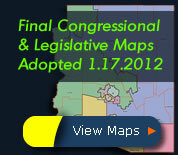 This website also contains a link to the website used by Arizona’s 2001 redistricting commission. Mission: The Independent Redistricting Commission's mission is to redraw Arizona’s congressional and legislative districts to reflect the results of the most recent census. The concept of one-person, one-vote dictates that districts should be roughly equal in population. Other factors to be considered are the federal Voting Rights Act, district shape, geographical features, respect for communities of interest and potential competitiveness. The state Constitution requires the commissioners – two Republicans, two Democrats and an independent chairwoman – to start from scratch rather than redraw existing districts. The Independent Redistricting Commission posts all meeting notices on its website and at the offices of that IRC (4000 N. Central Avenue Suite 1150, Phoenix, AZ 85012). You may sign up to receive notice of all Commission meetings by using the link to receive the Commission's meeting notice subscription.